The Prime Minister, Dr Manmohan Singh, today said that measures to institute more transparency in political funding would be explored, with the aim to reduce corruption in public life. Prime Minister Manmohan Singh (L) shakes hands with Infosys Chairman and mentor Narayan Murthy (R) at the inauguration of the Global Education Centre at Mysore, 140 km from Bangalore, on Saturday. The government is actively considering to further rationalise the existing customs duty structure to align India’s tariff structure with those of Asean countries. Sources said that the Budget is likely to contain measures to evolve a proper three-tier customs duty structure for raw materials, intermediate goods and finished goods. The Rajasthan High Court has issued contempt notices against the companies, Pepsi and Coca-Cola, for not heeding its order that their bottles should specify the contents of the soft drinks they sell. India's merchandise exports have reached $61 billion mark in the first 10 months of the current financial year registering a 26 per cent growth over the same period in the previous year. Whatever may be the tall claims of the powers that-be, Indian civil aviation continues to be in doldrums. Almost all plans, schemes, projects and programmes continue to remain half-backed. Volumes of tall words have been spoken and written by the ministry officials but the health of Indian airports remains feeble. Q: Not permitting the capital gain from mutual fund units to invest in equity oriented mutual fund units under Section 54 ED is unfair because both are same components and either go directly to the market or through mutual fund. However in future, to buy equity oriented mutual fund units one has to pay transaction tax. Here in Karnataka on a two-day visit, he told mediapersons before leaving the city that may be the state should conduct elections rather than political parties, taking away a major incentive for parties to resort to corruption to fill up their coffers for use during election time. Earlier in the day, he mooted the idea of the Centre setting up a ‘Knowledge Commission’ in order to promote high-end research activity in the country. Speaking after inaugurating Infosys’ Global Education Centre at Mysore near here, he said the aim would be to identify research pockets of excellence in the country and promote them in such a way that research work could be catalysed and also tap into high-end research work outsourcing coming from abroad. Infosys’ Global Education Centre, located in the 270-acre Infosys Mysore campus, can accommodate 4,500 trainees at any given time. Infosys’ total investment commitment in the Mysore Centre is Rs. 520 crore of which Rs. 285 crore has been pumped into the Global Education Centre complex. It has 2,350 rooms spread across the campus with 58 training rooms, 183 faculty rooms, a cyber café, a library, and fitness and recreational facilities. The centre will run a 14.5-week residential foundation program, which will impart generic and stream-specific training in various technology areas, along with soft skills and leadership programs, to fresh engineering graduates. The government is actively considering to further rationalise the existing customs duty structure to align India’s tariff structure with those of Asean countries. Sources said that the Budget is likely to contain measures to evolve a proper three-tier customs duty structure for raw materials, intermediate goods and finished goods. Presently, there are four basic customs duty rates. The peak rate for non-agricultural goods (except motor vehicles and seconds and defectives of iron and steel) is 20 per cent. The other major slabs of customs duty rates below peak rate are 5 per cent, 10 per cent and 15 per cent. The three-tier customs duty structure, which the government is contemplating, is likely to be centred around the following parameters — the lowest rates (possibly five per cent) would be applicable to basic raw materials; the middle rung rate (possibly 10 per cent) would be applicable for intermediates and the peak rate (between 15 to 20 per cent) would be applicable to the finished goods. The sources, however, said that consumer durables, because of their very nature, may attract a higher-than-peak rate. “This is to prevent imported goods flooding the Indian market. Moreover, a lower import duty for consumer goods could result in a situation where multi-national electronic goods manufacturers may find it more profitable to import goods from free trade areas rather than producing within the domestic economy here,” the sources added. In addition, motor vehicles, specified agricultural goods and demerit goods are likely to attract much higher than the peak customs duty. The government is examining various anomalies where an inverted customs duty structure is prevalent. An inverted duty structure is a phenomenon where the duty payable by intermediate goods is higher than that of finished goods. “The customs duty on raw materials should be lowest, with a slightly higher customs duty on intermediates and highest duty on finished goods. The rationalisation of customs had been going on since the last few years. In fact from 1991, when there were 22 customs duty slabs, they have been brought down to four. But anomalies do exist in certain sectors and correction is required,” the sources added. A Bench comprising Mr Justice S.K. Keshote and Mr Justice A.K. Rastogi passed the order yesterday on a petition by advocate Swati Bhati, who pointed out that the two companies were yet to implement the court's order of October 8, 2004. In October last, a Bench comprising Chief Justice Anil Dev Singh and Mr Justice K.S. Rathore had ordered that the companies should list out the quantum of various elements in their soft drinks on the bottles. "Without this, their sale should not be allowed," they had said. The court observed that while the companies wanted to hide the contents of the soft drinks on account of business interests, such interests were subservient to the fundamental and basic rights of the citizens. Commerce and Industry Minister Kamal Nath said India's merchandise exports would exceed the target of 16 per cent growth set for the year to reach a level of around $75 billion. With the high growth achieved despite strengthening of the rupee vis-a-vis US dollar and the overall impact of rise in fuel prices on competitiveness, the country was clearly "heading towards a doubling of its percentage share of world merchandise trade and increasing its exports to $150 billion dollars by 2009", the Minister said. Exports in the month of January are estimated to be over $7 billion. The latest shocking revelation has come about the Devanahalli International Airport at Bangalore. The project has been on the drawing board for the last more than five years and it is still to take-off in a real big way, as it should have. 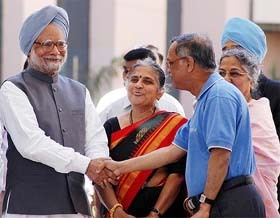 Prime Minister Manmohan Singh was invited for laying the foundation for the project. When he came to know that this was the third foundation laying stone ceremony, his office diplomatically said that the ‘PM would rather review the project’s progress’. The authorities had no option but to cancel the plan for laying the foundation stone. The aviation observers say that ‘opening of skies’ will not provide boost to Indian civil aviation until red-tapism is removed from the ministry corridors. All plans concerning renovation, upgradation and construction of airports at Delhi, Mumbai, Amritsar, Lucknow, Hyderabad, Kolkata and several other centres is lagging behind because of lackadainical approach of the Airports Authority of India. The AAI does not complete its projects nor does it allow others to complete them. “The opening of skies will be rewarding only when the government bigwigs keep their minds open”, said three internationally renowned commanders. Two world renowned manufacturers, Airbus Industrie and Boeing, are making more ‘noise’ on Indian scene than national carriers, which are unable to widen their umbrella because of paucity of aircraft. The opening-of-skies policy, for example, has provided all the advantages to the private operators instead of improving the health of national carriers. While Airbus is launching super-jumbos, Boeing is buoyant about Indian sales. US Aerospace Boeing chief Harry Stonecipher has gone on record as saying: “Everybody is talking about China and Asia, but India like Russia, has incredible growth and incredible passenger traffic”. Children’s Gift Growth Fund (CGGF), 1986, was prematurely terminated by the UTI. However, please clarify whether the units under the CGGF on redemption are eligible for calculating capital gains or loss. The interest component of the investment has been reinvested into units every year and the units were held for more than 10 years. A student during the final year of his academic course goes for industrial training to a software company. The company pays him an amount of say Rs 12,500 per month as stipend for 12 months. Will the student have to pay any income tax on above amount? If he has to pay tax, are there any deductions that can be claimed by the student? A: The authorities are basically substituting capital gains tax by transaction tax. On the one hand you get exemption from capital gains tax while having to pay a small amount of transaction tax. Therefore, there is no exemption accorded to investors on account of the transaction tax. However, for traders of securities, whose gains are taxed as business profits can set-off tax on such profits against the transaction tax. For CGGF, it appears that you have submitted the interest component for taxation every year, right from 1986. Therefore, only the interest component for the current year will be taxed in your hands, if your kid is still a minor. The stipend is income and hence taxable. The standard deduction will be allowable. He will be able to invest in schemes u/s 88 to claim rebate on income-tax payable. A: The long-term capital loss can be set-off only against the long-term capital gains whereas the short-term capital loss can be adjusted against either long-term or short-term gains or both. Unadjusted loss cannot be set off against business income or income under any other head. It can be carried forward for similar setoffs for as many as eight years. This was the situation even before the amendments implemented by FA04 and continues to be so even afterwards. However, any long-term capital gains arising out of sale or transfer effected on or after October 1, 2004 of an equity share in a company or a unit of an equity- oriented fund and where such transaction is chargeable to securities transaction tax, is tax-free. If the gain is tax-free, the loss is also tax-free. In other words, the loss cannot be set off. Q: I am a naturalised US citizen. I am planning to sell residential plot in Bangalore for capital gain of about 50 lakh. 1. Is there anyway to avoid capital gain tax or minimise taxes? 2. I was told if I invest in Nabard bonds, I can avoid paying taxes. Is it true? If so, how long do I have to keep in those bonds? 3. How to repatriate the funds after maturity? A: For saving tax on Long Term Capital Gains (LTCG) you can invest an amount equivalent to the LTCG in infrastructure bonds of Nabard, NHAI, NHB, REC or Sidbi within six months from the date of transfer to claim tax exemption u/s 54 EC. The lock-in period of these bonds is three years. The current interest rate is around 4.9 per cent and this is fully taxable, not even covered by Section 80 L. Obviously, the interest is quite low and it does not make any sense in opting for cumulative option. The tax will have to be paid on this interest on accrual basis. The same benefit can be accrued u/s 54ED by investing in IPOs of eligible issues. You may also claim similar benefit u/s 54 or 54 F by investing the LTCG to purchase a residential house within one year before or two years or to construct a residential house within three years after the date of earning the capital gains. Section 54 is applicable to capital gains arising from transfer of a residential house and requires the amount of capital gains to be reinvested whereas Section 54 F is applicable for other assets (residential plot) and requires the entire sale proceeds to be reinvested. In the case of exemption u/s 54 F, the assessee should not own more than one house on the date of earning the capital gains. The new house has a lock-in of three years. 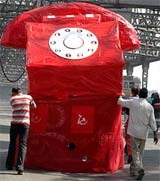 Regarding your third query, India has taken a giant step in the direction of full convertibility. Through Circular 67/2003-RB, dated January 13, 2003 supplemented by RBI Master Circular 4/2004-05, dated July 1, 2004. Earlier, it was possible to repatriate forex on current account and also some specified small amounts on capital account. Now, it has become possible for an NRI or a PIO to repatriate as much as $ 1 million per calendar year for bona fide purposes out of the sale proceeds of assets held in NRO accounts. He should have acquired the assets in question, out of rupee resources when he was in India or by way of legacy/inheritance from a person who was a resident in India. Sale proceeds of immovable property, assets acquired by way of Inheritance/legacy, deposit with a bank or a firm or a company, provident fund balance or superannuation benefits, amount of claim or maturity proceeds of insurance policy, sale proceeds of shares and securities and any other asset held in India, in accordance with the Fema are eligible for repatriation. In the case of immovable property acquired out of rupee funds, repatriation of sale proceeds is available subject to the condition that the property should have been held for a minimum period of 10 years. If such a property acquired out of rupee funds is sold after being held for less than 10 years, remittance can be made, if the sale proceeds have been held by the NRI/PIO for the balance period in NRO Account (savings or term deposits) or in any other eligible security (such as Nabard bonds), provided such investment is traced to the sale proceeds of the immovable property.